Drains are an essential part of any commercial flat roof; however, it is critical to position them at the lowest point of a roof. When not appropriately placed, water will pool, causing load-bearing stress on the structure and the rubber membrane, which leads to leaks. Pooling water tends to separate seams around skylights, vents, a/c units, etc. The video below demonstrates how to replace a drain on a commercial flat roof. The roof should slope toward the drain. Drain and pipe must be significant enough for any volume of water. 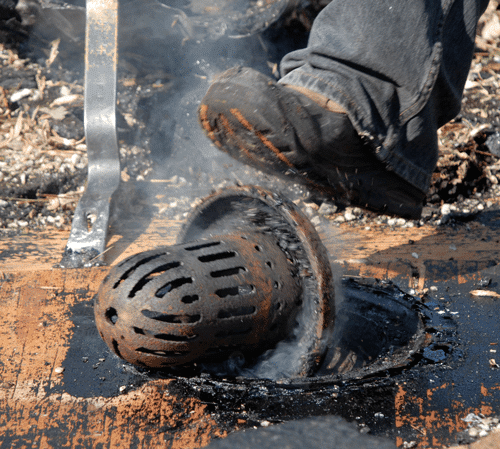 A drain strainer must be designed to allow small debris and water to flow freely to the drain. 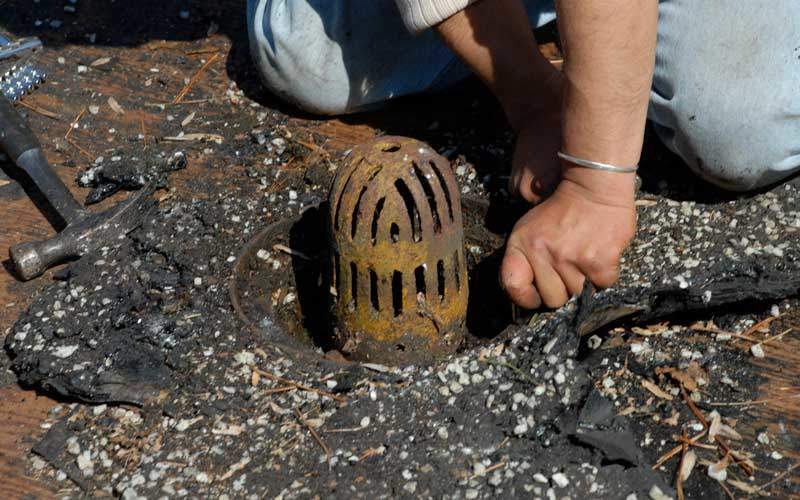 The placement of the drain, to other rooftop units, should be carefully determined. 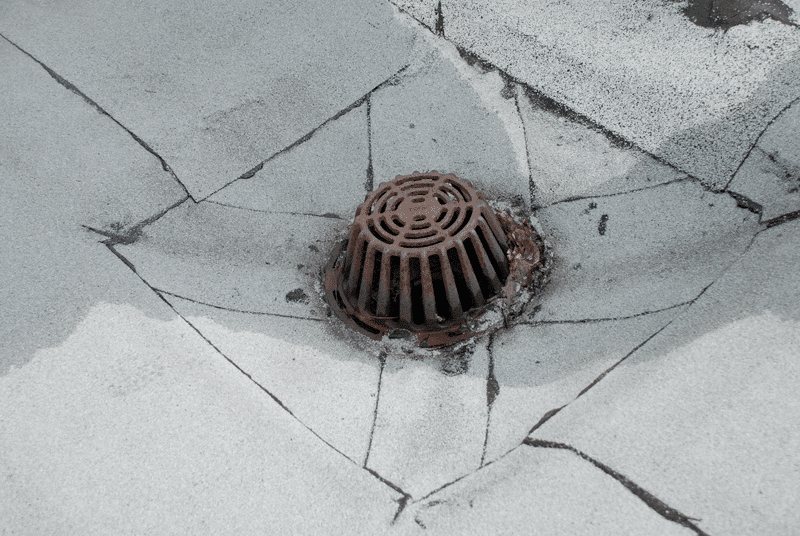 Although drains are on a flat roof’s surface, the inner drain pipes exist on the inside of the building, and below the ground surface leading to a drainage system. This prevents the pipes from freezing during the extreme temperatures of winter. Scuppers are openings in parapet walls, of commercial flat roofs, from which water can drain. These are very effective since water will flow freely through them, to a dedicated controlled area. 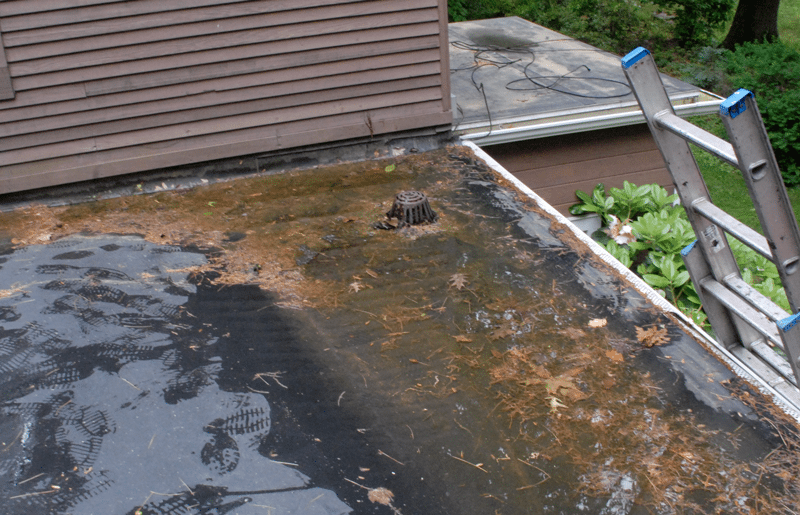 Outer drains begin on a commercial flat roof surface that is attached to drain pipes, which lead down the outer wall of a building, to the ground surface. During extreme winter weather conditions, water in these leader pipes, can freeze and crack the pipes. Gutters are a type of drainage system that is used to divert water from a roof and away from a building’s walls and foundation. In extreme winter weather conditions, water tends to freeze causing a build-up of ice, in the troughs, which prevents drainage. A basin is a lowered area, recessed into a flat roof’s substrate, where water converges and drains, even when there is an accumulation of debris. The images show drains that are correctly at the lowest part of the roof. The problem is, however, that an accumulation of debris is preventing water from draining. If these roofs had drain basins, water could have flowed over the debris. 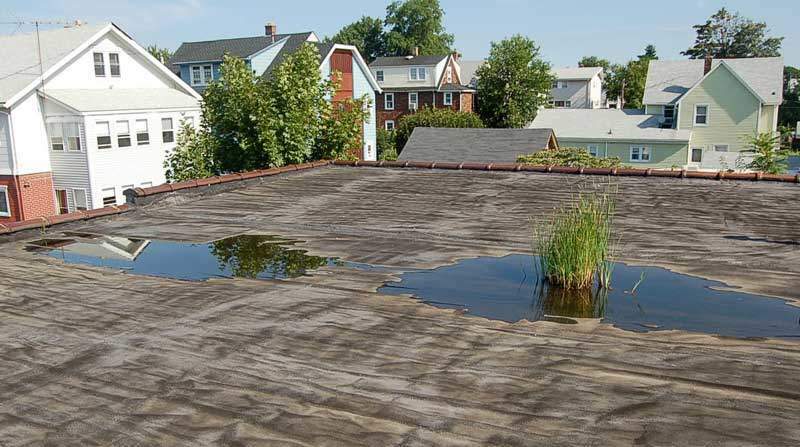 This flat roof slopes toward the center of the roof where the drain is, however, the installation of a basin would have prevented ponding water and the growth of plant life. …this image shows an example of a drain that functions as a proper drainage system on a commercial flat roof. This cast iron drain and strainer is from the 1930s. Notice the small “basin” around the strainer. This basin was a good idea, but could not handle the amount of debris accumulation, and the strainer holes and slots were too small and narrow.